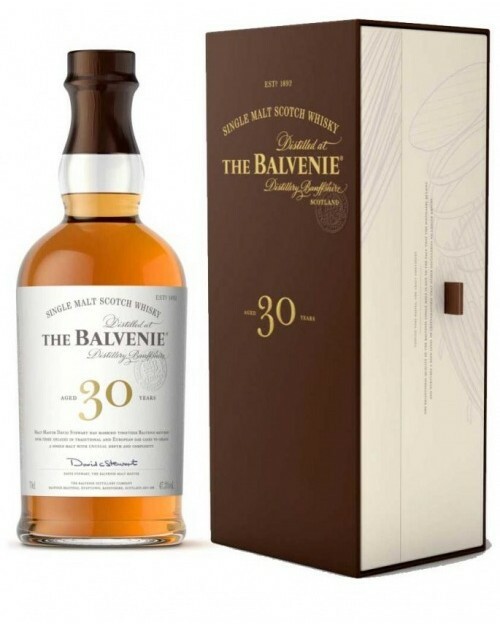 Balvenie 30 Year Old Single Malt Whisky was a Gold Medal winner at the 2004 International Wine and Spirits Competition. It was matured in American oak and sherry casks before being bottled at cask strength. It is a very fine expression as we expect from this revered distillery. Throughout there is an edge of smoke and malty peat. This new 30 Year Old bottle is housed in a beautiful box, with gentle illustrations and printed details about this rare expression. Nose: Lightly scented; floral notes. Palate: Rich, warming with honey, sherry and light tobacco notes. Finish: Long with aromatic notes lingering. Marvellous.